Slender wood spindles and a rectangular frame form the back of this lovely dark washed dining chair, giving it an airy, contemporary feel. A carved seat and sturdy, lightly tapered legs connected by coordinating supports complete the picture. 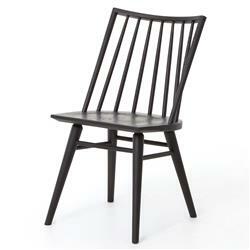 Stylish and elegant, this chair looks great in virtually any modern dining area.